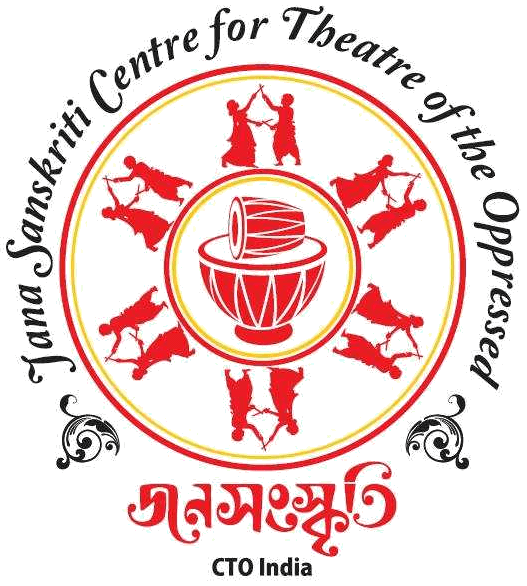 Jana Sanskriti(JS) Centre for Theatre of the Oppressed established in 1985 was the first exponent of Theatre of the Oppressed (TO) in India. Today the Centre is seen as one of the most important point of references to the global community of Theatre of the Oppressed. Jana Sanskriti believes that there is perfection latent within every individual –waiting to be discovered and manifested. When a person discovers this perfection he is able to overcome the sense of inferiority imposed upon him by the centralised social culture. He becomes articulate, confident and capable of confronting challenges, which come on the path of development. Jana Sanskriti’s goal is to create a space in which the oppressed will have enormous scope for introspection and discovery of the self and to facilitate a meeting between the individual and the perfection within himself. For “what is this perfection but the richest resource of human society?”Over 3 decades JS has addressed issues like domestic violence, child marriage, girl child trafficking, child abuse, maternal& child health, primary education & health care, illicit liquor, etc. – all through theatre. A recent study headed by Dr.Jyothsna Jalan of Centre for Studies in Social Sciences, Kolkata has proved the impact of ‘spect-acting’ in creating a strong community of active & responsible citizens. The study highlights the crucial role of participatory theatre in changing social norms. 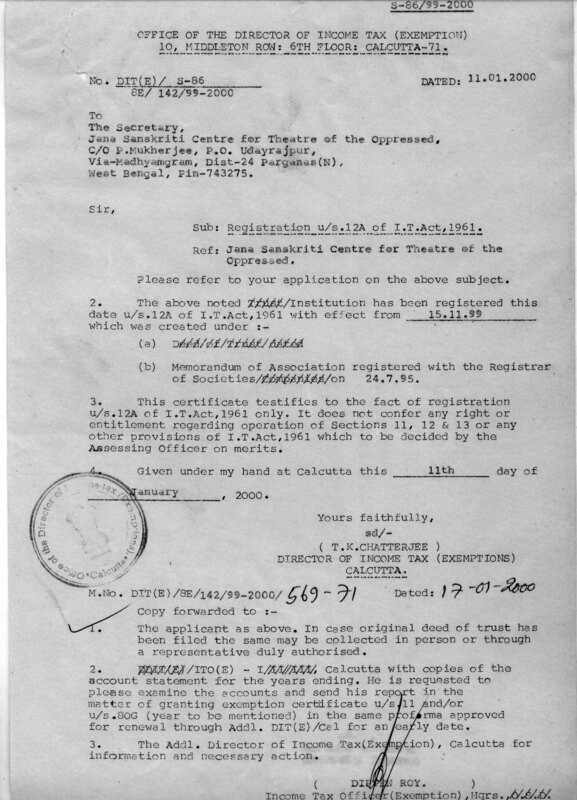 Jana Sanskriti’s journey began from a small village in the Sunderbans in 1985. Today it has 30 satellite theatre teams in West Bengal (mostly in the districts of South 24 Parganas and Purulia), two in Tripura, two in Jharkhand, one each in New Delhi and Orissa. Teams have also been formed in Maharashtra, Gujarat, Uttar Pradesh, Rajasthan, and Karnataka. These teams reach at least 2,00,000 spectators every year through their performances. As Augusto Boal said, “Jana Sanskriti is the largest and the longest lasting forum theatre operation in the world”. Of the teams in West Bengal, nine are all-women theatre teams, perhaps another first in India. Jana Sanskriti also organises a bi-annual Forum Theatre festival called Muktadhara since 2004. The important reason for organizing this Festival is that it becomes an international meeting ground for the Forum Theatre teams across the world as well as those trained by Jana Sanskriti all over India. Each of these teams is active in their own regions; most of them are also heading organizations engaged in struggles to assert the rights of the marginalized. These festivals have been highly successful and attended by noted theatre personalities from India as well as from all the continents. In November 2015, Jana Sanskriti International Research and Resource Institute (JSIRRI) came into being unifying artist-activists from across the world justifying the Indian ethos represented in "Vasudhaiva Kutum Bakum"
In India, Jana Sanskriti is the only exponent of Forum Theatre in which members of the theatre team select, construct, and narrate a social problem from their daily life. With artistic direction this play is taken to an audience who must now find a solution to the problem. Passive spectators then become engaged spect-actors. Spect-actors come on stage to enact the solutions they have thought of, debating with trained activists about the feasibility of the solutions suggested. Thus individuals publicly engage in tackling a problem that has thus far provoked the most profound cultural silence and acceptance. This exercise gradually suggests possibilities for liberation from that oppression in real life. Over the years we have seen that the experience of ‘spect-acting’ has motivated people to be active outside theatre as well. In Image Theatre actors and spect-actors recreate images of their own reality – through consensus. They look at their reality in an objective manner, try to understand and analyse it. This is called the real image. Spect-actors then proceed to make the image of a situation that they desire – the ideal image - in which the oppression will have disappeared. We then return to the real image and debate begins. Each spect-actor must then show images of different stages in the possible transition from real to ideal. This entire experience becomes a rehearsal of how to deal with oppression in real life.IntrospectiveTheatre affords an individual the scope of being her own spectator. As a spectator she introspects, analyses and understands the reason for every small experience of oppression in her life. She discovers the talent within herself – this gives her confidence. She recognizes how various social values are guiding her actions. BINODINI MONCHO, BOAL AUDITORIUM, AMULYA GANGULY MEMORIAL LIBRARY, HOSTEL FACILITIES. Read more about them here. An "open stage" in Digambarpur village, South 24 Parganas is situated hardly 300 metres away from the Mridangabhanga river. Recognizing "art as the basic need" for every human being irrespective of any socio-economic disparity, Jana Sanskriti along with the local agricultural farmer's community conceptualized MUKTA MANCHA. It was built in early 2000 by the local community using bamboos, mud, hay and ropes. This space is central to Jana Sanskriti's activities in the Sunderbans. This space is utilized by the local government and well as the village community for theatre, dance, drawing, painting, meetings and performances.